Increased levels of B lymphocyte stimulator (BLyS) are associated with systemic autoimmunity in animal models of spontaneous autoimmune disease, and transgenic animals expressing BLyS develop typical autoimmune disease. Here, we demonstrate significant elevations of BLyS in the patients with systemic lupus erythematosus (SLE). The BLyS isolated from the sera of SLE patients had the same m.w. as the natural soluble form and was able to stimulate B cell activation in vitro. Increased BLyS in SLE patients was partially associated with higher levels of anti-dsDNA Ab of the IgG, IgM, and IgA classes, but not associated with the disease activity. Our results suggest that BLyS may be a useful marker for early activation of an autoimmune diathesis and likely plays a critical role in triggering activation of self-Ag-driven autoimmune B cells in human SLE. BLyS may provide an effective therapeutic target in systemic autoimmunity. The TNF superfamily plays a crucial role in the regulation of immune response by inducing either apoptosis or proliferation or both in lymphocytes (1). B lymphocyte stimulator (BLyS)3 (B cell activation factor from the TNF family (BAFF), TNF and apoptosis ligand-related leukocyte-expressed ligand 1 (TALL-1), a TNF homologue that activated apoptosis NF-κB, NH2-terminal kinase (THANK), zTNF4), a newly identified member in the TNF gene family, is a type II membrane protein that exists in both membrane-bound and soluble forms. BLyS exhibits a strong costimulatory function for B cell activation in vitro (2, 3, 4, 5). Systemic administration of soluble BLyS results in B cell expansion and elevated levels of Igs (2). More importantly, it has been recently demonstrated that BLyS-transgenic mice develop severe B cell hyperplasia and autoimmune lupus-like disease characterized by the presence of autoantibody against nuclear Ags and immune complex deposits in the kidney. Prolonged survival and hyperactivity of the B cells contributes to the disease phenotype (6, 7). In two murine models of human systemic lupus erythematosus (SLE), MRL/Mp-lpr/lpr and NZB/W F1 mice, there are increased serum levels of BLyS that seem to correlate with autoimmune kidney damage, and the treatment with the soluble BLyS receptor significantly improves the survival of lupus mice (8). These results indicate that increased expression of BLyS may lead to systemic autoimmune disease in mouse models and imply a potential role for BLyS in human autoimmune disease. Therefore, in the present study, we examined serum levels and function of BLyS in the patients with SLE. Our results demonstrate that BLyS found in the sera of SLE patients functions as a stimulator for B cell activation and is markedly elevated compared with normal controls. Peripheral blood was obtained from 150 SLE patients meeting the American College of Rheumatology (ACR) criteria for the classification of disease (12). Serum from 40 patients was harvested and stored at −30o to −70°C until use, and plasma from a second, independent cohort of 110 SLE patients was collected and also stored at −30o to −70°C until use. Two additional subgroups of patients with positive antinuclear Abs (ANA) titers but who did not meet the ACR criteria were also selected. Disease activity was assessed by direct clinical assessment with the systemic lupus activity measure (13) usually on the same day as the blood specimen and always within 6 days. Cumulative disease damage was assessed with the Systemic Lupus International Cooperating Clinics (14) damage index at the same time. Thirty-eight normal control sera were obtained from the University of Alabama Blood Bank. Forty-four sera and 57 synovial fluids from patients fulfilling the ACR criteria for rheumatoid arthritis (RA) were also collected and stored as above. All studies were reviewed and approved by the Institutional Review Board, and written informed consent was obtained. Monoclonal anti-human BLyS Abs were generated in BALB/c mice immunized with the recombinant soluble BLyS. 15C10 (IgG2a, κ) and 3D4 (IgG1, κ) recognize the soluble form of BLyS specifically and are able to neutralize the activity of BLyS. 9B6 (IgG1, κ) recognizes the membrane-bound form of BLyS and denatured BLyS in Western blot. Polyclonal anti-BLyS Ab was raised in rabbits immunized with the recombinant BLyS and affinity-purified by the BLyS-conjugated Sepharose column. Irrelevant murine IgG isotype controls were purchased from Southern Biotechnology Associates (Birmingham, AL). The sandwich ELISA for measurement of soluble form of BLyS was developed in Human Genome Sciences (Rockville, MD). Briefly, a 96-well plate was coated with purified monoclonal anti-BLyS Ab (clone: 15C10) at 3 μg/ml in PBS at 4°C overnight, and blocked with 1% BSA PBS. The purified recombinant BLyS (2) was used as standard. 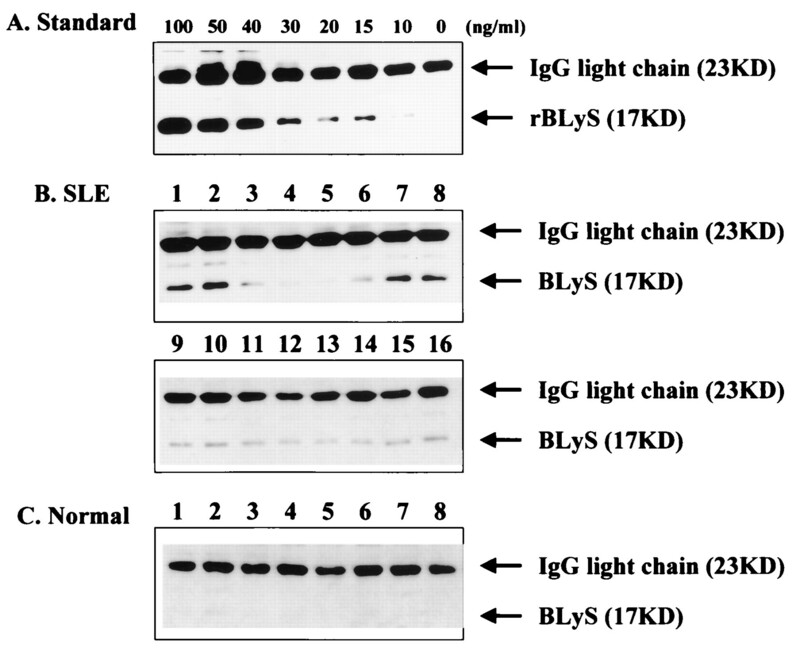 All sera or plasmas were preabsorbed with protein A-agarose to deplete Igs, 1:10 diluted in 3% BSA PBS, and incubated in the ELISA plate at 4°C overnight. After washing, the plate was further incubated with 0.2 μg/ml biotin-conjugated polyclonal anti-BLyS Ab at room temperature for 2 h. After addition washing, the plate was incubated with 1:30,000 diluted HRP-conjugated streptavidin (Southern Biotechnology) for an additional 1 h at room temperature. The reaction was developed by the tetramethylbenzidine substrate (Sigma, St. Louis, MO), and read in an E-Max plate reader (Molecular Device, Sunnyvale, CA). A standard curve using serial dilutions of the recombinant BLyS (5.57, 1.86, 0.62, 0.21, and 0 ng/ml) was incorporated into each assay. The absolute value of BLyS for each tested sample was calculated from the best fit of the standard curve, determined by nonlinear regression, and multiplied by the dilution factor. Purified monoclonal anti-BLyS Ab (15C10) was conjugated to cyanogen bromide-activated Sepharose beads (Pharmacia, Uppsala, Sweden) according to the manufacturer’s instructions. The recombinant BLyS was serially diluted in 3% BSA PBS as control. One milliliter of each serum was preincubated with 100 μl of the protein A-agarose beads at room temperature for 1 h. The absorbed sera were incubated with 100 μl anti-BLyS-conjugated beads at 4°C overnight. The beads were washed five times with PBS containing 0.1% Tween 20, and denatured in 50 μl of the SDS loading buffer. The samples were separated in 15% SDS-PAGE and blotted onto nylon membranes. After blocking with 5% nonfat dry milk, the blots were probed with 1 μg/ml of a second monoclonal anti-BLyS Ab (clone: 9B6) at 4°C overnight. After washing, the blots were further incubated with HRP-conjugated goat anti-mouse IgG1 at room temperature for 1 h. The blots were developed with chemiluminescense (Kirkegaard & Perry Laboratories, Gaithersburg, MD). Flat-bottom 96-well culture plates were coated with 10 μg/ml of anti-BLyS Ab or murine IgG1 isotype control at 4°C overnight. After washing and blocking with 3% BSA PBS, various concentrations of the trimerized recombinant BLyS in 100 or 200 μl of serum were added to each of three wells and incubated for 1 h at 37°C. To insure the maximum binding of BLyS to the plates, the incubation with fresh sera was repeated three times. BSA buffer was used as a control. Splenic B cells harvested from BALB/c mice were used as the indicator for B cell proliferation. The B cell fraction was enriched from total spleen cells by depleting Thy1.2-positive cells with anti-Thy1.2 Ab and complement. Cells (5 × 105) from the B cell-enriched fraction were added to each well and incubated with 2 μg/ml of F(ab′)2 anti-μ polyclonal Ab (Jackson ImmunoResearch, West Grove, PA). The cultures were conducted for 72 h, and B cell proliferation was determined by [3H]thymidine incorporation assay. The proliferation index is presented as the ratio of cpm in the presence of BLyS captured from the recombinant BLyS solution or from sera in comparison to the buffer control. To determine the ability of an excess of soluble receptor and of blocking Ab to inhibit proliferation, the B cells were incubated with the BLyS captured by 15C10 in the presence of 10 μg/ml of control IgG, 15C10, or transmembrane activator and calcium modulator and cyclophilin ligand interactor (TACI)-Fc. ELISA kits for anti-dsDNA, anti-Sm, and Sm ribonucleoprotein were purchased from Helix Diagnostics (West Sacramento, CA). Assays were performed according to the manufacturer’s instructions except that HRP-conjugated anti-human IgM and IgA (Southern Biotechnology) were used for Ig classes. Total IgG, IgM, and IgA were measured by ELISA; the paired, purified, and HRP-conjugated anti-human IgG, IgA, and IgM were purchased from Southern Biotechnology, and affinity purified human IgG, IgM, and IgA were used as standards. Statistical analysis was performed using the Student t test or ANOVA test for comparison of population samples. A value of p < 0.05 was used to reject the null hypothesis. Using a sandwich ELISA, we measured the levels of BLyS in the sera of 150 patients with SLE, and 38 normal controls. Two independent sets of SLE sera (SLE1) and plasmas (SLE2) were collected and assayed. The serum levels of BLyS in both sets of samples from SLE patients were found to be significantly higher (p < 0.0001) than normal controls (Fig. 1⇓). A very similar pattern of BLyS was found in both patient populations. The serum BLyS levels in majority of normal controls were below 5 ng/ml, and <10% were higher than 10 ng/ml. None of the normal controls was above 12 ng/ml. In contrast, the BLyS levels in most SLE patients were higher than 5 ng/ml, and > 30% were above 10 ng/ml. Approximately 10% of SLE patients exhibited very high levels (>20 ng/ml) of BLyS. The BLyS levels in a few SLE patients were as high as nearly 40 ng/ml. Interestingly, the BLyS levels in the sera of 44 patients with RA and the synovial fluids of 57 RA patients were also significantly higher than that in normal sera. Elevated levels of BLyS in the patients with SLE and RA. Two independent cohorts (SLE1, n = 40; SLE2, n = 110) of SLE patients and 57 RA patients were included in this study. All patients met the ACR criteria for SLE. Controls were drawn from normal blood bank donors. The serum levels of BLyS were measure by ELISA. 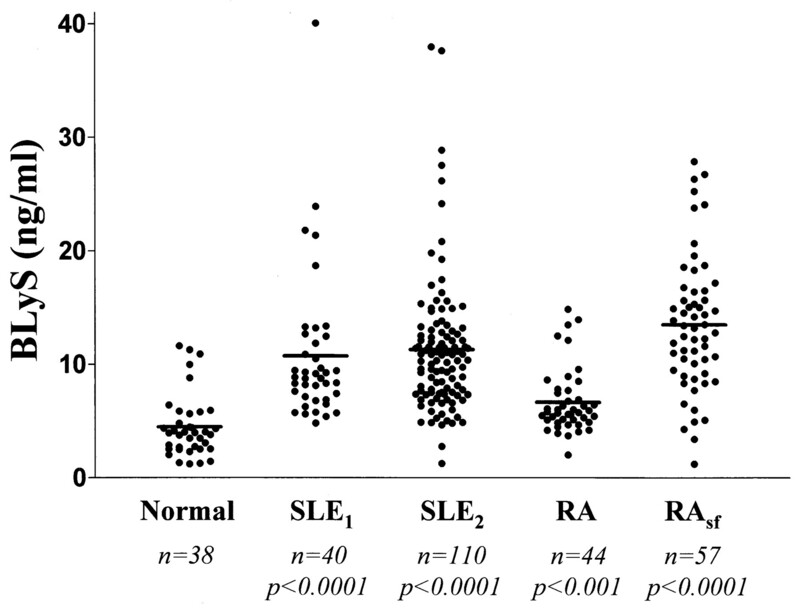 The horizontal bars indicate the average of each group: normal, 4.48 ± 0.45; SLE1, 10.74 ± 1.04; SLE2, 11.30 ± 0.57; RA, 6.68 ± 0.43; RA synovial fluid, 13.51 ± 0.79 (mean ± SEM). The p value was determined by t test. BLyS can naturally exist in both membrane-bound and soluble forms (2). To determine whether the BLyS in sera corresponds to the predicted soluble form of BLyS, immunoprecipitation with an anti-BLyS mAb was performed. Using the recombinant soluble BLyS as a control, immunoprecipitation of BLyS revealed a 17 kDa protein (Fig. 2⇓A). Dose-dependent immunoprecipitation of recombinant BLyS demonstrated a threshold for detection of about 15 ng/ml. The soluble form of BLyS was detected in all 16 sera of SLE patients tested, and the size of the immunoprecipitated BLyS exactly matched the 17 kDa of the recombinant BLyS (Fig. 2⇓B). However, only one (no. 2) of eight normal controls was weakly detected (Fig. 2⇓C). Taken together, these results indicate that serum levels of BLyS are elevated in the patients with SLE, and the increased BLyS in SLE1 exists in the soluble form, which is cleaved from cell surface. Characterization of BLyS in the sera of SLE patients. BLyS was first immunoprecipitated with anti-BLyS mAb-conjugated Sepharose beads, and separated in 15% SDS-PAGE. The presence of BLyS was determined by Western blot analysis using a second monoclonal anti-BLyS Ab. A, Immunoprecipitation of the recombinant BLyS. The serially diluted recombinant soluble form of BLyS was immunoprecipitated and detected by Western blot analysis. B, The BLyS was immunoprecipitated from 16 sera of SLE patients. C, Eight normal sera were processed by the same procedure. The upper bands were the IgG light chain from the Ab from the affinity beads. The lower bands were the soluble form of BLyS as indicated by the apparent molecular mass of 17 kDa. To determine whether the BLyS in the sera of SLE patients is functional, the B cell costimulation assay was performed using an anti-BLyS mAb to capture the BLyS in serum onto 96-well plates and then to costimulate B cells in the presence of anti-μ Abs. First, we compared the capacity of two monoclonal anti-BLyS Abs and a murine IgG1 isotype control to capture recombinant BLyS on 96-well plates. Two anti-BLyS Abs (clone: 15C10 and 3D4) exhibited the ability to capture of recombinant BLyS while one the isotype control showed no significant capture activity. With 15C10 as a capture Ab, the captured BLyS was able to bind a BLyS receptor fusion protein (TACI-Fc). This binding correlated well with the binding of polyclonal anti-BLyS (Fig. 3⇓A). In coculture of anti-μ F(ab′)2-stimulated B cells with the captured and immobilized recombinant BLyS, dose-dependent B cell-proliferative responses were observed with mAbs 15C10 and 3D4 as capture Ab (Fig. 3⇓B). A significantly increased B cell proliferation response was seen in the presence of ≥10 ng/ml of the Ab-captured recombinant BLyS. Taken together, these results indicate that some anti-BLyS Abs, when immobilized, are able to capture functional BLyS. Because both 15C10 and 3D4 in solution are able to block the functional epitope of BLyS (data not shown), we infer that the recombinant BLyS includes polymeric forms and that all functional epitopes of polymeric BLyS are not blocked by the immobilized 15C10 and 3D4 capture Abs. Indeed, this is supported directly by the availability of TACI-binding epitopes in our ELISA (Fig. 3⇓A). Furthermore, because BLyS has to be trimerized to function, this capture method may detect and mimic polymeric forms of BLyS in the biological samples. B cell costimulatory activity of BLyS in the sera of SLE patients. The capture of BLyS and its functional activity were assayed as described in Materials and Methods. A, Capture ELISA for BLyS. Dose-dependent stimulation of B cells by immobilized recombinant BLyS. C, BLyS activity in the sera of SLE patients. Each tested sample was the pool of three individual 200-μl serum aliquots. D, Block of BLyS activity by an anti-BLyS Ab and TACI-Fc. Costimulation index was calculated by the ratio of the cpm from the serum captured by anti-BLyS Ab vs the cpm from the capture Ab alone. Each point represents the average of the triplicate cultures. Normal, 1.01 ± 0.05; SLE, 1.67 ± 0.12 (mean ± SEM). The p value was determined by t test. Using mAb 15C10 to capture BLyS activity in SLE1, the B cell costimulatory activity in the sera of SLE patients was significantly higher (p < 0.001) than that in normal control sera (Fig. 3⇑C). Although normal sera showed no significant costimulatory activity, most sera from SLE patients exhibited increased costimulatory activity in anti-μ induced B cell proliferation. 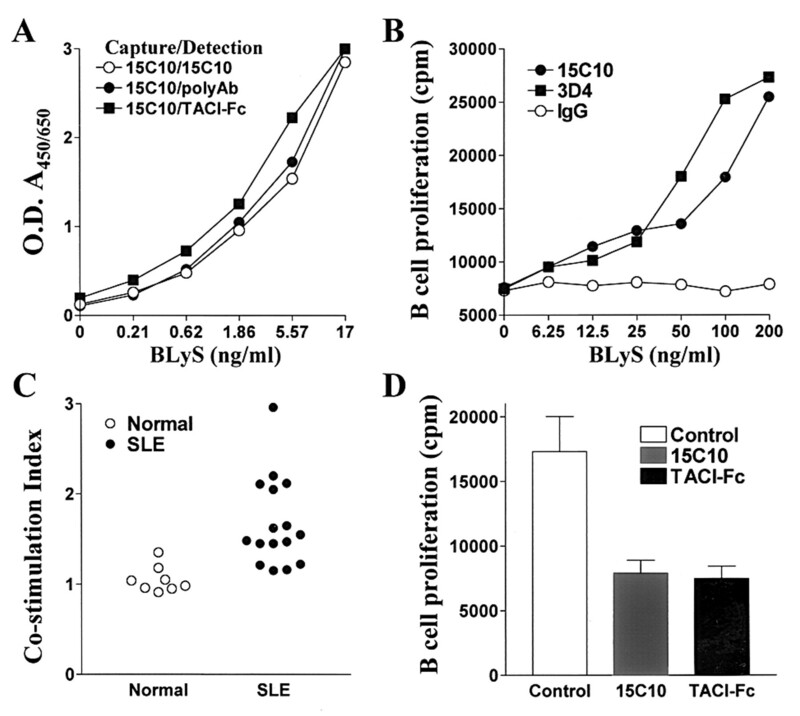 The B cell costimulatory activity captured in SLE1 is specific for BLyS, because the preabsorption of SLE1 with anti-BLyS Ab eliminated the activity (data not shown), and excess mAb 15C10 or TACI-Fc added to the culture media inhibited the costimulation of BLyS (Fig. 3⇑D). These results indicate that BLyS is not only increased in SLE patients but also can function as a B cell stimulator. To determine whether increased levels of BLyS play a role in the production of autoantibodies, the sera of SLE patients were divided into two groups according to their BLyS levels: SLEhigh (BLyS > 15 ng/ml) and SLElow (BLyS < 5 ng/ml) (Table I⇓). The SLE patients with high levels of BLyS exhibited significantly higher levels of anti-dsDNA Ab in each of the IgG, IgM, and IgA classes compared with the SLE patients with low levels of BLyS and normal controls (p < 0.0001). The percentage of positive anti-dsDNA Ab was also significantly higher in the patient group with high BLyS. The SLEhigh patients were 80%, 80%, and 60% IgG, IgM, and IgA anti-sdDNA Ab positive, compared with 30%, 20%, and 10% in SLElow group, respectively. Total IgA and IgG levels were slightly but significantly higher in the SLEhigh group compared with the SLElow and control groups (p < 0.005 and p < 0.05, respectively), while total IgM levels showed no differences. Two major anti-nuclear protein autoantibodies, anti-Sm and anti-Sm ribonucleoprotein, were also measured in two SLE and control groups. Both autoantibody levels were significantly higher in both SLE groups compared with normal controls but there was no consistent difference between the BLyShigh and BLySlow groups (data not shown). These results indicate that increased levels of BLyS in SLE patients are associated with increased production of anti-dsDNA Abs, which may participate in disease pathogenesis, but not with other anti-nuclear protein Abs. We also analyzed the clinical data of the second group of SLE patients. In general, there was no correlation of increased BLyS levels with clinical SLE activity as determined by the systemic lupus activity measure index and by ESR. Although BLyS levels were associated with anti-dsDNA Ab, they were not associated with global organ damage as determined by the Systemic Lupus International Cooperating Clinics index or with renal damage as determined by serum creatinine (data not shown). These results indicate that single point increases in the levels of BLyS are unlikely markers for the activity and severity of SLE. However, we also analyzed two subgroups of the patients with positive ANA but who did not yet meet the formal ACR criteria for classification as SLE. The first group with only a positive ANA exhibited slightly higher BLyS levels (8.59 ± 0.82; n = 8) compared with normal controls. In contrast, the second group with a positive ANA and the clinical impression of lupus had significantly increased BLyS levels (14.94 ± 2.99; n = 5; p < 0.01 between two groups). These results suggest that an elevated level of BLyS precedes the formal fulfillment of the criteria and may be a useful measure of immune activation. Such an interpretation is consistent with findings of moderately elevated BLyS in sera from patients with RA (6.68 ± 0.43 ng/ml; n = 44; p < 0.0003 compared with normal) and in RA synovial fluid (13.51 ± 0.79; n = 57; p < 0.0001 compared with both normal and RA sera). SLE is a systemic autoimmune disease characterized by autoantibody production against self Ags. Autoreactive B cells are driven by self Ag, but the factors that promote the loss of B cell tolerance and drive autoantibody production are still unknown (9). Endogenous B cell stimulatory factors are attractive candidates in this process, and BLyS has been recently identified as a potent B cell stimulatory molecule associated with systemic autoimmune disease in animals (5, 6, 7, 8). Our results establish a link of BLyS to SLE in humans. The serum levels of BLyS were significantly higher in our SLE patients compared with normal controls, and this finding was replicated in a second, independent SLE population. The increased levels of BLyS appear to be associated with the production of anti-dsDNA Ab, which suggests that the role for BLyS in SLE might be to selectively trigger B cell tolerance loss driven by dsDNA. The increase in all classes (IgG, IgM, and IgA) of anti-dsDNA Abs in the SLE patients with high levels of BLyS argues that BLyS might be a primary factor acting directly on the B cells to drive production of anti-dsDNA Ab in a T cell-independent fashion. The finding that BLyS level is associated with anti-dsDNA Ab, but not other anti-nuclear protein autoantibodies, suggests that mechanism for production of autoantibodies against dsDNA might be different from that of other autoantibodies against nuclear proteins. Thus, BLyS might play a crucial role in early activation of self-Ag-driven autoimmune B cells with autoimmune T cells further driving the switch for production of pathogenic IgG autoantibodies. In fact, this model is supported by animal models in which the transgenic expression of BLyS is sufficient to drive production of anti-dsDNA Ab without significant involvement of T cells (6, 7, 8). The clinical manifestations of human SLE are both diverse and variable, and the tools to measure disease activity and disease damage are imperfect. Therefore, it is not surprising that circulating, soluble BLyS levels were not correlated with SLE activity and severity. Nonetheless, it is interesting to note patients with a positive ANA but no other ACR criteria for lupus had marginally elevated BLyS levels while those with a positive ANA and several criteria for lupus had even higher levels. This result suggests that an elevated BLyS precedes the formal fulfillment of criteria for SLE and raises the intriguing possibility that it may be a useful marker for early activation of an autoimmune diathesis. Taken together, our data suggest that BLyS is involved in the loss of B cell tolerance and that additional factors may determine progression of SLE. BLyS naturally exists in both membrane-bound and soluble forms and may be produced primarily by monocytes (2). Our data indicate that the protein form of circulating BLyS in SLE patients is consistent with the naturally cleaved, soluble form and that it can function as a potent B cell stimulator comparable to recombinant soluble BLyS. However, many interesting questions are apparent. The cell population(s) that produce BLyS in SLE and the role of membrane-bound BLyS in production of autoantibodies through cell-cell interaction may provide insight into the pathogenesis of SLE. Among TNF gene superfamily members, some proteins transduce proliferative signals while others provide apoptosis signals (1). Because deficiencies in apoptosis can lead to the development of lupus-like disease (10), BLyS might well play an anti-apoptotic role in B cell tolerance loss. Indeed, blockade of BLyS function with a soluble form of BLyS receptors can decrease disease severity and prolong the survival in animal lupus models (8). Thus, our results suggest that anti-BLyS might be a potential therapy for human SLE and other autoimmune disease. We thank Dr. Fiona Hunter for editing the manuscript. ↵1 This work was partially supported by the grants from the Juvenile Diabetes Foundation, Arthritis Foundation, and National Institutes of Health. ↵3 Abbreviations used in this paper: BLyS, B lymphocyte stimulator; SLE, systemic lupus erythematosus; ANA, antinuclear Abs; SLE1, SLE sera; SLE2, SLE plasmas; RA, rheumatoid arthritis. Sm, Smith Ag; TACI, transmembrane activator and calcium modulator and cyclophilin ligand interior. Wallace, D., A. L. Metzger. 1997. Systemic lupus erythematosus: clinical aspects and treatment. W. J. Koopman, ed. Arthritis and Allied Conditions 13th Ed.1319 Williams and Wilkins, Baltimore.